Happy April Fools! I don't have any jokes today because I'm really not much of a prankster. Short of replacing the sugar with the salt, I never have any ideas. Do you have any last-minute prank suggestions I can use on my hubby? I've mentioned before that I'm a busy, working mom so it shouldn't be a surprise that I'm always on the lookout for fast, family-friendly meals. During the week, French Dip Sandwiches are one of my all-time favorites. My husband's a huge fan of French Dips and after several attempts, I've finally perfected them. They're simple, delicious and only five ingredients. Prepare the AuJus according to the package instructions. 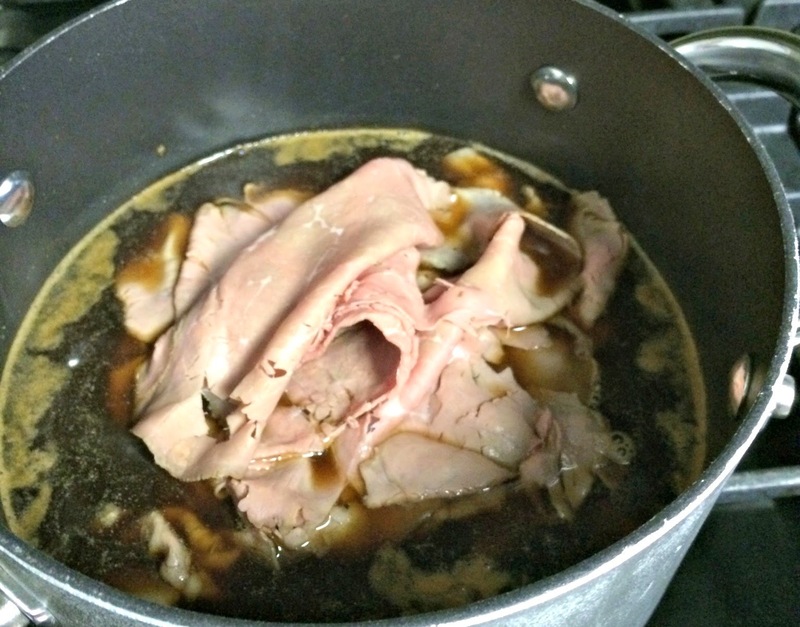 Once the AuJus is throughly heated throughout add the roast beef and turn to low heat. Let the roast beef heat all the way through, about 3-4 minutes depending on how thick the beef is sliced. Slice the bread and place it under a 500-degree top broiler with 2-3 slices of provolone cheese. Once the cheese melts and the edges of the bread are slightly brown, remove it from the oven and pile on the beef. Add a drizzle of horseradish sauce to top it off and then slice the sandwich. Don't forget to make a small bowl of AuJus for dipping! It's simple and delicious but best of all, it's a weeknight favorite. I love this! It's great that the ingredients list is short. That definitely makes cooking during the week so much easier! I completely agree, plus my time in the grocery store is precious. I hate pushing my cart up and down the aisles looking for ambiguous items. These are fairly common and easy to find. This looks delicious Brittany! 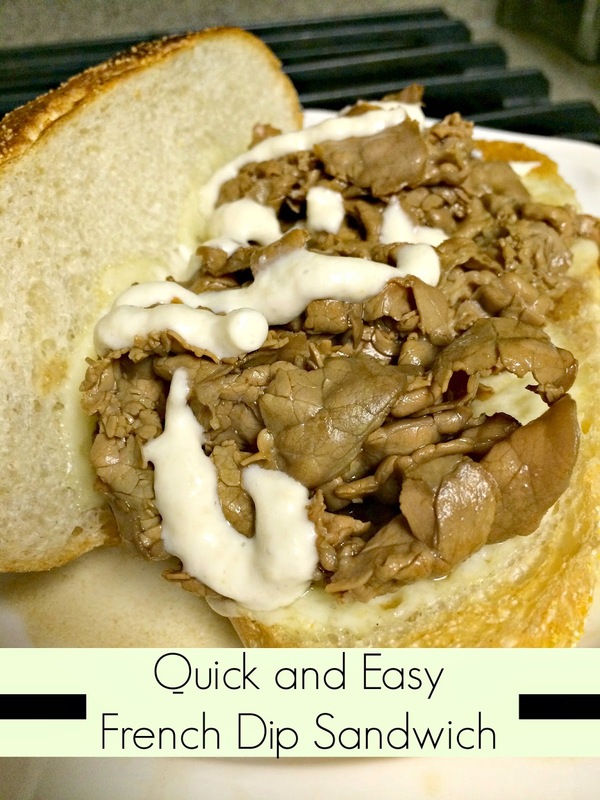 I tried making a french dip for rob a while back and it did not go over well, I'm gonna have to try this! I love how quick and simple this looks! Definitely want to give it a try. Thanks Chantel! This is definitely a winner if you're looking for quick and simple. My hubs would love that! !